Carpet is still very popular for many reasons even though it might seem like wood floors are dominating the market. We believe there is a carpet for everyone! A great choice for many rooms, carpeting is softer, warmer, and thanks to some advances in stain-resistance (some are 100% waterproof), it’s great for people with kids and those who plan to age in place. Geometric patterns can be achieved through texture or color. No matter how this look is created, these modern carpets add a beautiful and sophisticated look to your home. While a neutral palette is still a great foundation for your home, the 2018 trend of incorporating more color has hit the carpet industry as well. Bold colors are being used to create a beautiful anchor point for a room. It’s also a great way to add color without purchasing bold furniture you may tire of in a year or two. You can build a whole room from the carpet up, choosing neutral furniture and styles that enhance a custom rug. Blues and grays are always popular, especially in our seaside market. Both colors provide a range of hues from pastel to vibrant, so they have universal appeal. Color is back! Adding color to your room through carpet is a creative way to make a statement and allows you to purchase more neutral furniture pieces without sacrificing the wow factor. When someone comes into the store, we ask them if they are interested in a carpet that’s plush and thick or short and tight. The main reason we ask is because people can be bothered by vacuum lines and footprints in their carpet. A thick carpet will show those while shorter ones won’t. Keep that in mind as you buy—this is an investment into your home and you don’t want to be frustrated by your carpet every time you vacuum. When it comes to texture, carpet offers a wide range of options that can be broken down into a three categories: soft, textured, and ribbed. The softness of carpet is what makes it so unique and there is a surge in the carpet market as people return to this luxurious feel. 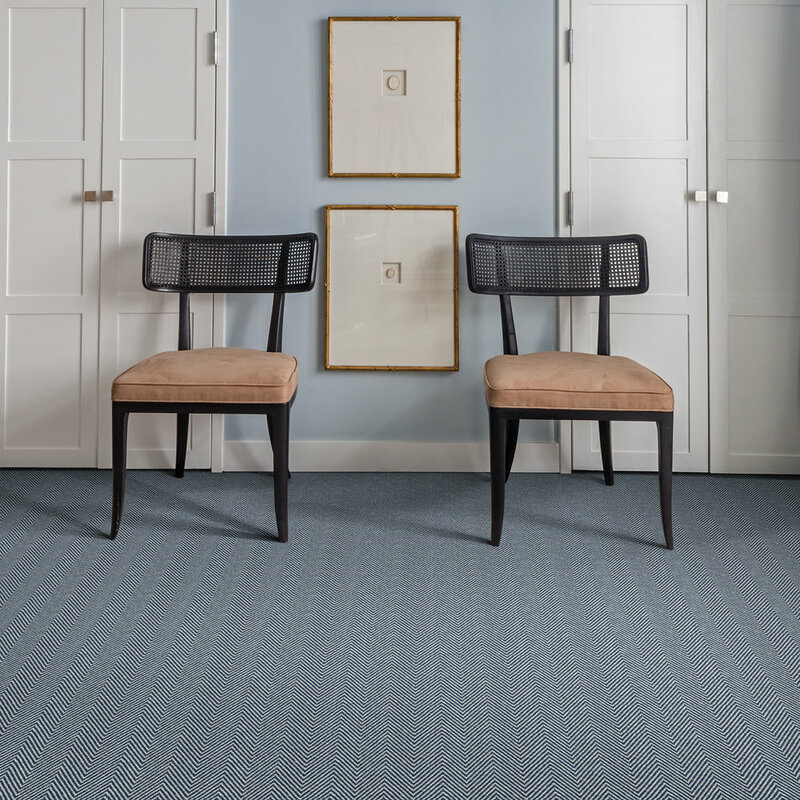 Textured carpet uses traditional lines, abstract shapes, carving, and trending patterns like chevrons to create either a repeating pattern or a randomized look. Texture also creates a fun feel as you walk through your home. Ribbed carpet tends to be used in more industrial settings but the sleek, clean look can work in modern homes. It’s also practical for indoor/outdoor carpets and minimalist area rugs. When choosing a carpet, the first step is to select the texture. A plush carpet might feel great but if you will be bothered by vacuum lines and footprints, then a shorter carpet is your best bet. Geometric patters are a popular option this year and will stay strong into 2019. Moroccan trellis designs and hexagons are also a trend for carpets and walls. For years people have seen carpet as less durable and more difficult to maintain than wood or tile floors; however, that perception is changing thanks to advancements in the industry and the reality of living with other flooring surfaces. Wood needs to be resealed from time to time, tile can chip, and grout ages so maintenance-free floors are really a myth. Companies like Shaw have developed their Tuftex carpet which won’t absorb liquid for up to four hours and when you combine that with a waterproof carpet pad you wind up with a floor that can stand up to the wear and tear of even the most energetic kids and pets. Carpet is a beautiful and practical option with a modern look and modern durability for today’s family and home. With a wide range of colors, textures, and patterns, there is a carpet out there for you! From laminate to hardwood, carpet to vinyl, Floor Meisters is your Naples source for flooring. Dave, Judy, and their son T.J. Meister bring a level of passion and knowledge rivaled by few in the industry. Together, the Meisters have a combined 80 years of experience in the flooring and design world and have made a commitment to offer great floors at a great price.